State Rep. Dean Arp, R-Union, said Gov. Roy Cooper created a slush fund 10 times larger than actual mitigation costs by preying on vulnerable energy utilities seeking approval of a state permit to build the Atlantic Coast Pipeline. The secret $57.8 million escrow account Cooper negotiated has poisoned the process, and the companies should not pay the money to the state as promised, said Arp, chairman of both the House Appropriations and the Energy and Public Utilities committees. Arp questioned state Department of Environmental Quality officials involved with a controversial water permit during a Tuesday, March 6, meeting of the Joint Legislative Commission on Energy Policy. 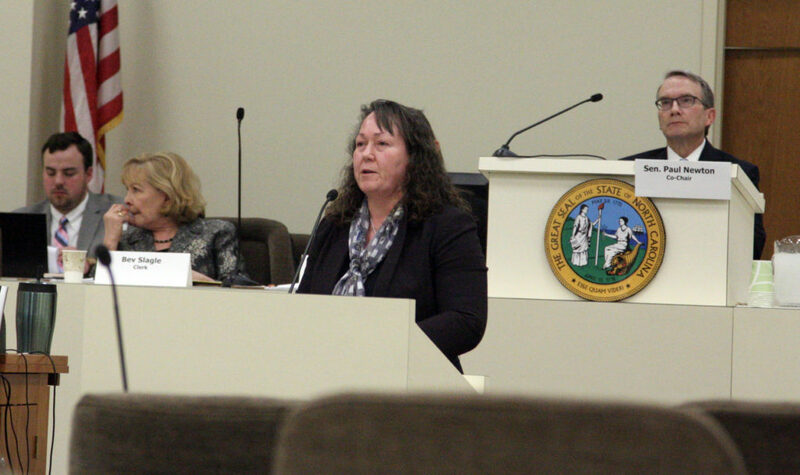 Sheila Holman, DEQ assistant secretary for the environment, told lawmakers Dominion Energy, Duke Energy, and their partners paid $6 million in mitigation fees related to North Carolina’s portion of the ACP. That sum would cover all costs to restore streams, wetlands, and buffers to their natural state following pipeline construction, Holman testified. The fees were determined as part of the normal permitting application process. They had nothing to do with the separate Mitigation Memorandum of Understanding Cooper worked out with the pipeline partners. Cooper said the energy company coalition voluntarily agreed to pay the money. He wanted to use it for environmental mitigation, economic development, and renewable energy projects in a discretionary fund under his control. The General Assembly passed House Bill 90 to take control of the money, and shift it to the school systems in the eight N.C. counties through which the pipeline would pass. The pipeline would start in West Virginia, cross through southeast Virginia, and follow the Interstate 95 corridor in North Carolina to Robeson County. “The voluntary payments are almost 10 times what the actual environmental mitigations are, and it just reeks of a slush fund that breaks the trust in the government’s authority to permit in a truthful way projects that are necessary,” Arp told Carolina Journal after the meeting. “What I’ve heard from this governor repeatedly is separation of powers. That’s what his big thing is. Checks and balances,” Arp said. “Well the constitution of North Carolina is clear that the appropriations power belongs to the state, and I think it’s extremely dangerous for the governor to set up a parallel economy where they have the appearances of shakedown of companies that want to get a permit,” Arp said. Arp contends Cooper trashed public trust by mixing voluntary outlays with state-required payments tied directly to legal mitigation requirements. He said an unsuccessful applicant now might have reason to suspect a permit could be rejected even though it met specifications. He said he has not heard whether Duke, Dominion, and their partners intend to make the $57.8 million payment. “I think they should not pay, quite frankly, even though we’ve appropriated the money for school use and so forth,” Arp said. During the meeting Rep. John Szoka, R-Cumberland, commission co-chairman, initiated the questioning about the permitting process. He noted that Holman testified the pipeline partners actually pledged to exceed required environmental mitigation efforts, and quizzed her whether the $6.025 million paid by the pipeline partners covered all potential environmental hazards. “I don’t anticipate additional ones,” Holman said. Holman said permits issued by DEQ would not be affected in any way by Cooper’s memorandum of understanding, and that the agency did not work with the governor on his side deal. She said she first learned of his negotiations with the pipeline partners sometime in January. She said the governor did not ask the agency to slow its permit approval process, or coordinate the timing of its news release that the water permit was approved with Cooper’s news release 20 minutes later announcing the discretionary fund. Rep. Jimmy Dixon, R-Duplin, said the DEQ presentation reassured him the agency handled the permitting process by the book. But he said that made him even more perplexed why the memorandum of understanding was created.